I have a confession to make. I’ve never had mac & cheese from that iconic blue box. While eating the neon orange concoction was a childhood rite of passage for most of my friends, Kraft’s version was never very appetizing to me. However, this made-from-scratch mac & cheese, oozing with cheesy goodness, is a whole other story! Adding bacon to this is just pure genius! Thanks to my friend, Patti, who posted a photo of her mac & cheese on facebook, for reminding me that I had this recipe from Lori at RecipeGirl that I’ve been wanting to try. The breadcrumb topping gives this dish just enough garlic flavor without overpowering it. I love the crunch it gives the creamy, soft pasta. The tanginess of the goat cheese and the sharp white cheddar helps cut through the richness and the red pepper flakes gives it a little kick. Then, last but not least, there’s the bacon to “gild the lily.” If you really want to send this over the top, a few dashes of truffle oil will probably do the trick. This is truly a great mac and cheese!! I do have to warn you. 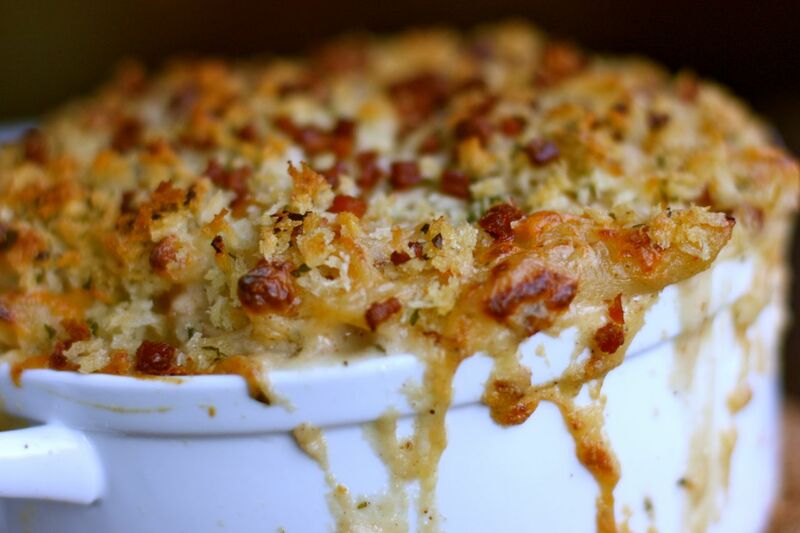 While mac & cheese is definitely one of the all-time best comfort foods, this is not for the faint of heart. It is decadent and indulgent, and very necessary, every once in a while! The recipe calls for whole milk, not cream, so it does save a few calories. While I don’t recommend eating like this all the time, please try to resist the urge to make this recipe “healthy.” It just won’t be as good. Sometimes, you gotta live dangerously (just carry your own defibrillator)! Preheat oven to 375 degrees. Butter a 3 to 4 quart casserole dish. To prepare the breadcrumb topping, place garlic and parsley in a small bowl. Add the panko breadcrumbs and pour in butter and mix until well combined. Set aside. In a large skillet (see note below), sauté bacon until it is almost crisp. Remove bacon to paper towels to drain. Remove all but 1 tablespoon of bacon drippings from the pan. Add 3 tablespoons butter to the bacon drippings and heat to medium. When butter sizzles, add flour and cook, stirring, for 1 minute. Slowly pour warmed milk into flour-butter mixture while whisking. Continue cooking, whisking constantly, until mixture bubbles up and thickens. Remove pan from heat and stir in thyme, mustard powder, red pepper flakes, salt, pepper, nutmeg, and paprika. Then stir in 3 cups cheddar, goat and Parmigiano Reggiano cheeses. Stir cooked pasta and most of the cooked bacon (reserve some bacon to sprinkle on top) into the cheese sauce. Pour mixture into prepared casserole dish. Sprinkle remaining cheddar onto the pasta. Scatter herbed breadcrumbs and remaining bacon over the top. Bake until browned on top, about 30 minutes. Check at 15 minutes and cover top loosely with foil if the breadcrumbs are browning to quickly. Transfer dish to a wire rack to cool for 5 minutes. Note: Use a large skillet or pot that is big enough to hold all the ingredients. This way you can use the same pan with the little bits of bacon stuck to it to make the cheese sauce for maximum bacon flavor. P.S. Leftovers reheat very well in the microwave. Therefore do i follow the 4 cups or the 1.5? Hi Kat! Thanks for your comment. I revised the error on the recipe. It should read 16 ounces or 4 cups of cheese. Yes, 8 fluid ounces = 1 cup, but by weight, 1 cup of shredded cheese is about 4 ounces. I happen to have a package of shredded cheese in my fridge and it says 8 ounces of shredded cheese = 2 cups. The recipe calls for 4 cups of cheese. I hope that clears it up. Looks really delicious ! I have to cook this 🙂 Thanks for sharing ! OK, I just made this for dinner. Oh my GOD this is good. I’ve never been a fan of mac and cheese in any form but now I’m a convert. UnbeLIEVEable good. It’s great that you’ve linked to your faves on your year-end round up. I’m a huge fan of bacon mac and cheese. I love the addition of the goat cheese — so smart! Tasty! Bacon and goat cheese ? You’ve created the perfect recipe! Well, I found the perfect recipe. This recipe was from Lori at RecipeGirl.com. I agree, though, it is the perfect mac & cheese! (Sorry, I just posed this comment under my boyfriends log in, whoops!) anything with bacon is at the top of my list, and somehow you made this even MORE delicious than I could have imagined. I LOVE the photos!!!!!!!!!!!!!!!!!!!!!!! anything with bacon is at the top of my list, and somehow you made this even MORE delicious than I could have imagined. I LOVE the photos!!!!!!!!!!!!!!!!!!!!!!! these look fantastic, Daisy! What a lovely recipe. I had packed the leftovers for lunch and it was still delicious, two days later, heated up in the microwave. This is definitely a keeper! 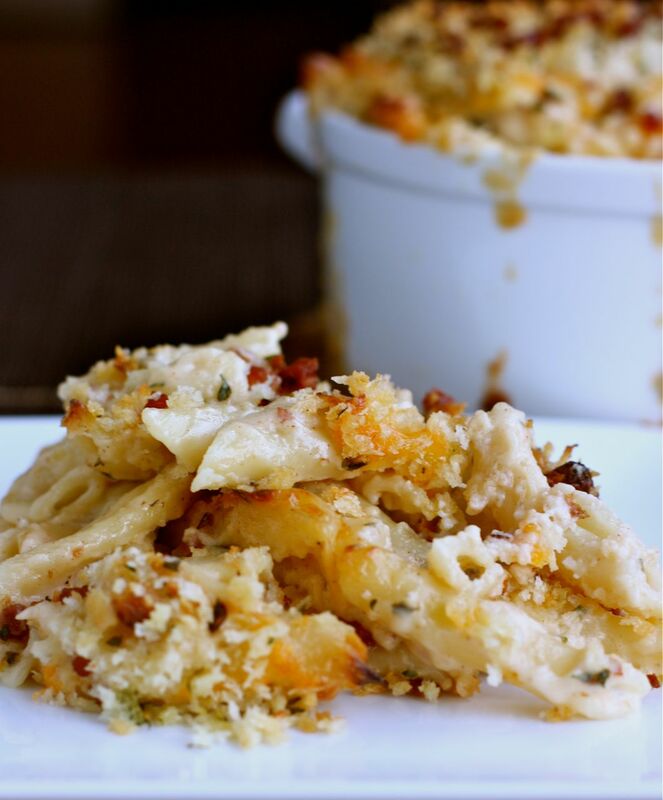 Of the many recipes I’ve tried for Mac and Cheese, this one had me at Goat cheese! Why didn’t I think of that…heehee! I just picked up my first bottle of truffle oil too, yuppers, will be trying this one soon to bring for the girls at work as my boys are still die-hard fans of the blue box. Lovely photo too! Now on to browse the rest of your blog while I enjoy a cup of tea. This recipe is so good! I brought leftovers for lunch today and I can’t wait to eat it. Thanks for visiting and let me know how your mac & cheese turns out.